Macs are glorious machines with a fiercely loyal fan base. Super-fast and with a killer OS, it’s no wonder people fall in love with them. However, in time even the newest and fastest of Macs will begin to slow down, as it gradually gets clogged up with unnecessary files and content. But worry not – help is at hand! With the all-new CleanMyMac 3 you can quickly and easily clean, optimize, and maintain your Mac. CleanMyMac 3 scans every inch of your system, removes gigabytes of junk in just two clicks, and monitors the health of your computer. 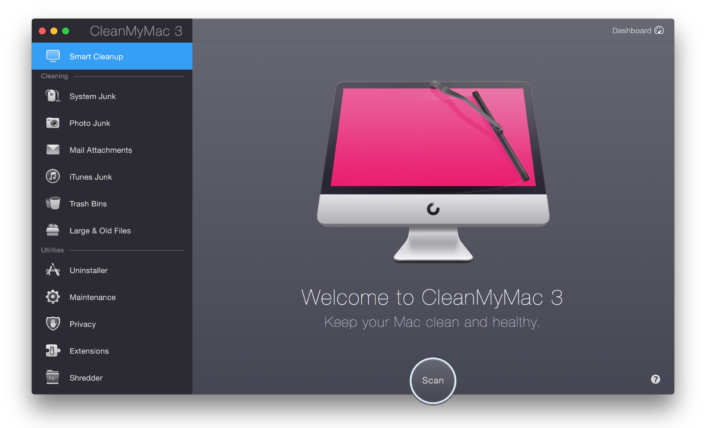 CleanMyMac 3 – Powerful, intuitive, simple. And we’re talking major deep-clean here. CleanMyMac 3 scans your whole system and removes all the clutter from the hard drive, including system junk, caches, large and old files, mail attachments, and much more. During a full scan with CleanMyMac, the average user finds about 74 GB of junk to clear out. That’s because it scans everything on your Mac, including your Mac’s system, iTunes, Mail, Photos, Trash bins, and even those pesky old folders that have been secretly avoiding you! Macs are easy to use. And MacPaw believes Mac cleaners should be too. That’s why CleanMyMac 3’s Smart Cleanup relies on just one button to scan every inch of your Mac and then remove the junk it finds. And, it only selects files that are 100% safe-to-delete, so you never have to worry about removing the wrong ones. It’s not just an automatic cleaning utility — it’s incredibly smart. How does CleanMyMac 3 know what to clean up? The thing about Smart Cleanup that makes it stand out against other Mac cleaners is its Safety Database. The Safety Database is a list of items, rules, and exceptions that CleanMyMac refers to in order to correctly select and clean out the junk on your Mac. It’s been updated and expanded over the past seven years — that’s seven years of working with developers to help improve CleanMyMac’s cleaning algorithm. Did you know? It’s not your photos that are wasting space, it’s the hidden cache in your Photos library. You see, anytime you view photos stored in iCloud or use Faces, cache files pile up on your Mac. In time, these files can add up to gigabytes of data, especially if you have a large library. The good news is CleanMyMac 3 cleans out all of them, without harming any of your precious photos. As the name implies, the Photo Junk module cleans up all the useless files left over by Photos. It’s 100% safe to use because it doesn’t remove any actual photos. The module scans your Photos library, locates useless cache files and heavy RAWs that take up space, and then deals with them seamlessly, to free up much-needed space. When you import RAW files into Photos, the app creates JPEG copies of them. These JPEGs are what you see in Photos — and heavy RAWs just sit on your Mac, forgotten. If you no longer need the RAW originals, CleanMyMac will remove them* to save you gigabytes of space. But don’t worry: it will always ask you first. *Please note, this feature is not yet available on macOS High Sierra. Just like the Photos app, iPhoto has tons of junk hidden in its library. It’s a whole different kind of junk, and CleanMyMac cleans that up, too. Clever, right? Photo Junk searches your iPhoto library to locate useless and hidden copies of your pics, kept by iPhoto after you rotate, or crop, for example. Clean up your mail effortlessly. Mail is a lot heavier than it looks! Each and every attachment you receive in Mail, from PDFs to signatures, get saved to your Mac. Know what that adds up to? A lot! Plus, if you want to manually clean out those gigabytes of attachments, you’d have to crawl through your entire mailbox searching for every single paper clip. Save yourself the trouble — CleanMyMac 3 is happy to take care of it for you. There’s more than just tunes in your iTunes… iTunes stores gigabytes of files other than your music, including outdated device backups, old software updates, broken downloads, and more. But it’s easy to clean up with CleanMyMac 3. Just do a quick a scan of iTunes and you’ll have more space for your tunes in no time. Simple. CleanMyMac 3 discovers files that you forgot even existed – so you can decide what’s really worth keeping. So, if you want to help keep your Mac fast, free-running and fully optimized, it’s time to try CleanMyMac 3. It scans every inch of your system, removes gigabytes of junk in just two clicks, and monitors the health of your computer – and it’s so easy to use. See for yourself today – download CleanMyMac 3 now.